Japan’s bullet trains have become instantly recognizable for their proudly futuristic design language, which gives them the impression of having come barrelling out of several decades from now. 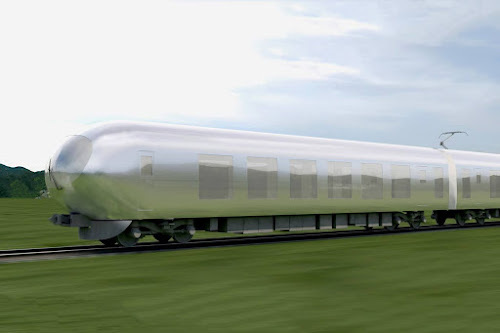 However, architect Kazuyo Sejima of Sanaa has decided to do away with all that in a new design for the next generation of the Seibu Railway Co. flagship limited express trains by cladding them completely in a semi-reflective metallic skin so that they all but blend into the surrounding landscape. “The limited express travels in a variety of different sceneries, from the mountains of Chichibu to the middle of Tokyo, and I thought it would be good if the train could gently co-exist with this variety of scenery,” said the Pritzker Prize winner. “I also would like it to be a limited express where large numbers of people can all relax in comfort, in their own way, like a living room, so that they think to themselves ‘I look forward to riding that train again.’” Set to hit the tracks of Tokyo in 2018, keep your eyes peeled for these unobtrusive but positively innovative trains that speak as much to good design as they do harmony with nature.